The Rzeszów archive is housed in a large modern building that opened in November 2016. The previous site of the archive had been a former synagogue in the old town center. The archive contains 11 fonds of Jewish metrical (vital) records, the largest of which is from the town of Rzeszów, with records up to the year 1942. Also included here is a fond containing records from Dobromil, now in Ukraine – the only non-Polish town with Jewish records in this archive. In addition, there are four fonds with Jewish community records, including from Rzeszów itself, and a large collection of material from Czudec, a part of which is from the Holocaust period. The Sanok sub-archive (Oddział w Sanoku), has Jewish metrical records from eight towns in the Sanok area, including from Sanok itself and Lesko. For the inventory of Jewish records held in the state archive in Rzeszów, click here. For the inventory of Jewish records held in the state sub-archive in Sanok, click here. The Kraków archive contains Jewish metrical records from 13 towns in the Kraków region, including material from Kraków itself from 1798 onwards. There are also record sets, both going to the end of the 1930s, from Nowy Targ and Krościenko nad Dunajcem. 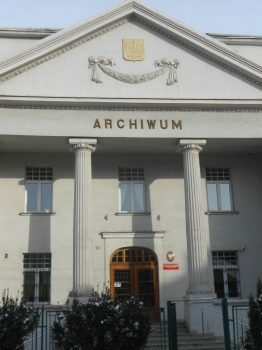 The Bochnia sub-archive (Oddział w Bochni) has Jewish metrical records from six towns, including from the town of Bothnia. For the inventory of Jewish records held in the state sub-archive in Bochnia, click here. The Nowy Sącz sub-archive (Oddział w Nowym Sączu) has metrical records from four towns – Grybów, Muszyna, Nowy Sącz, and Stary Sącz. There are also important sets of municipal documents (not specifically Jewish) from some of these and other towns in the region. Fond 15, for instance, with municipal records from Nowy Sącz, has 16 files with valuable information on the Holocaust in the town. In a similar way, Fond 18 contains files with Holocaust-period material from Krynica. For the inventory of Jewish records held in the state sub-archive in Nowy Sącz, click here. The Tarnów sub-archive (Oddział w Tarnowie) has Jewish metrical fonds from seven towns in the region, including from Tarnów itself and Dąbrowa Tarnowska. 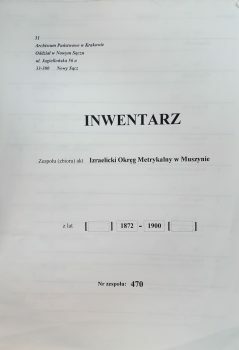 The large Fond 276, whose files are otherwise all from Tarnów, also contains two index books, from Nowy Wiśnicz and Tarnopol, both of which are likely to have ended up in this collection by mistake. All the other known Jewish metrical records from Nowy Wiśnicz are held in the state archives in Bochnia and Kraków. For the inventory of Jewish records held in the state sub-archive in Tarnów, click here. The Przemyśl archive contains a large number of files with Jewish metrical records or Jewish community material, from both eastern and western Galicia. 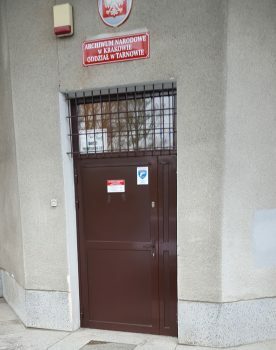 This is the only state archive in Podkarpackie (Subcarpathian) province that contains a significant quantity of Jewish records from places in eastern Galicia. There are town-specific fonds from 19 towns in the Przemyśl archive. For six of these towns, the material is from the Jewish community, and is not necessarily of genealogical relevance. These towns are: Dobromil (also with two files of metrical records), Jarosław, Jaworów, Ołpiny, Przemyśl (a single file on a Jewish school), and Tarnopol. The Tarnopol material (Fond 1657) consists of 72 files, though none of these are specifically genealogical in content. The archive’s Jewish metrical fonds are from: Kańczuga, Mikulińce, Mosty Wielkie, Oleszyce, Pomorzany, Przemyśl, Radymno, Sieniawa, Skałat, Skole, Stryj, Wielkie Oczy, and Zbaraż. Some of these fonds are largely composed of index books of metrical records, rather than the original record books. Apart from the town-specific fonds in the Przemyśl archive, there is a large collection of Jewish metrical and community records in Fond 154, from a mix of towns, from both eastern and western Galicia. There are even some files here from outside Galicia, including some death records, as well as index books of death records, from Lublin, and files of correspondence from Warsaw. Many of the metrical books in Fond 154 are index books. Fond 154 also contains a separate section, known as “Izraelicka Gmina Wyznaniowa 102” (IGW 102), with 102 files of a very mixed nature. Some contain material that does not fit neatly anywhere else, such as printed books in Hebrew and some early 20th-century handwritten Hebrew correspondence from a rabbi’s office in a Galician town. Also in this section of the fond are a Jewish census from Brody of 1850, and lists of ghetto residents in Stanisławów from 1942. As of early September 2017, however, IGW 102 had not been publicly available for the previous nine months, and it was unclear when, or in what form, this collection would reappear for researchers. For the inventory of Jewish metrical records in the Przemyśl State Archive, click here. Outside these seven state archives and sub-archive branches, the State Archive in Sandomierz, which town lies just outside the former Galicia, contains Jewish records from two Galician localities, Tarnobrzeg (Fond 921), and Radomyśl nad Sanem (Fond 1151). The Sandomierz archive is a sub-archive of the Kielce State Archive. The Polish State Archives are engaging in a long-term project to scan all their archival records and upload the scans to the website <http://szukajwarchiwach.pl>. As of late 2017, however, relatively little has been scanned as regards Jewish records in the archives of Podkarpackie province. Much more material, though, is expected to be online by the end of 2020. 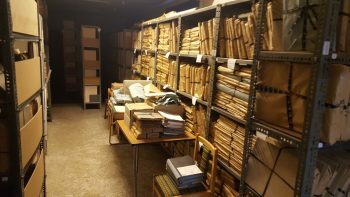 Online inventories for all the state archives in Podkarpackie province will be added to this page as links by mid-2018.